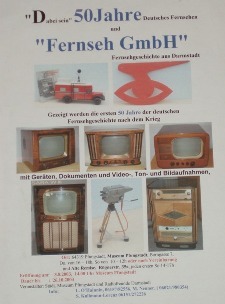 In our titel "Farvis TV-Museum Pfungstadt" you can recognize that this website represents two groups: Farvis (community of German TV-history) and the TV museum Pfungstadt with main focus on the "Fernseh GmbH Darmstadt". Farvis has been founded 2003 in Pfungstadt. Developed by a group of TV interested people, which have already organized several exhibitions in Pfungstadt, Darmstadt, Reinheim, Gernsheim, Groß-Gerau, Aschaffenburg and the last in 2006 in Kronach together with the company Loewe. 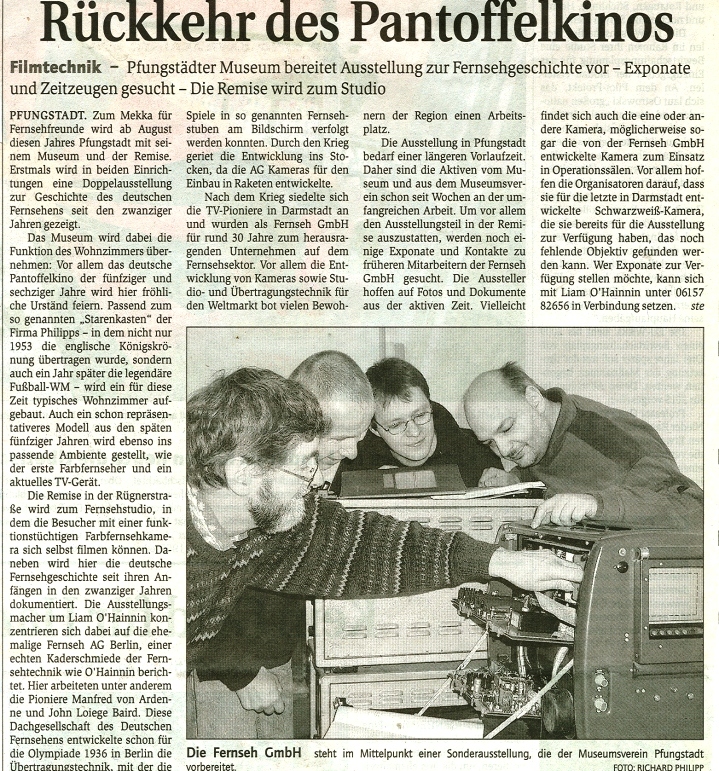 Photos and newspaper article of the meeting of Farvis in the hotel "Aschaffenburger Hof" from 23rd of October 2006. 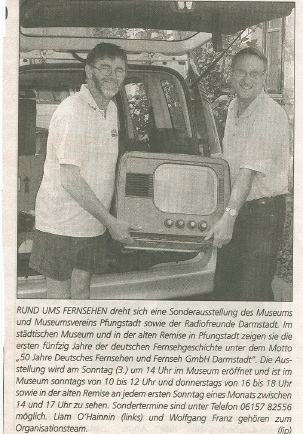 In addition to the above mentioned exhibitions two big exhibitions were held in Pfungstadt: The first in the civic museum Pfungstadt with the topic "Dabeisein - 50 Jahre Deutsches Fernsehen" about the history of TV in Germany and the second in the "alten Remise" in Pfungstadt with the topic "Fernseh GmbH - Fernsehgeschichte aus Darmstadt." 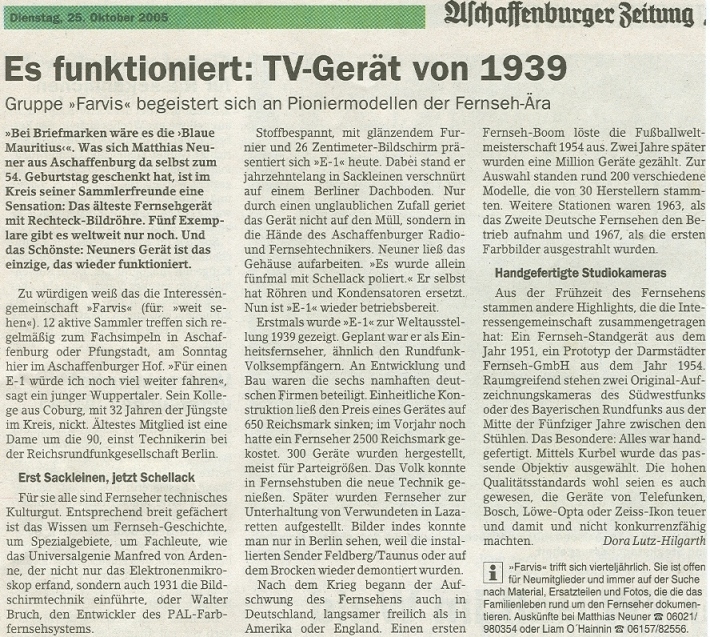 about the history of the "Fernseh GmbH Darmstadt". 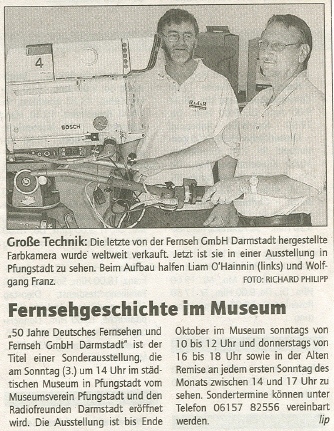 Newspaper article from the "Darmstädter Echo" about the exhibition in the "alten Remise" in Pfungstadt. We have published different articles on these topics in different professional journals and local papers. Apart from this we have partizipated in different radio broadcast to this topic. 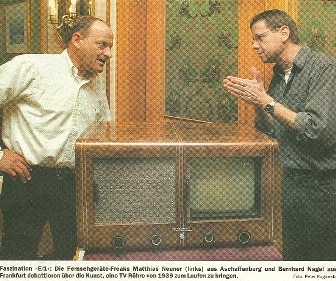 during the one-hour life radio broadcast MediaLine with the radio station RaDar (Radio Darmstadt) about the "Fernseh GmbH" and the TV history in general. The moderator Norbert Büchner had invited us to join the program MediaLine. Our group consists of about 20 active TV collectors from all over Germany. Fortunatly a lot of former employees of the "Fernseh GmbH Darmstadt" help us. In addition to the private collection of these members we have a big exhibition in our spaces in Pfungstadt. The focus area of the exhibition in the TV museum in Pfungstadt is the important role of the "Fernseh GmbH Darmstadt" in the TV- and Studiotechnicdevelopment in Germany and all over the world. In addition we have documented the TV history from the start until today. From the Nipkow-disc from Logie Bairds up to HD-TV. 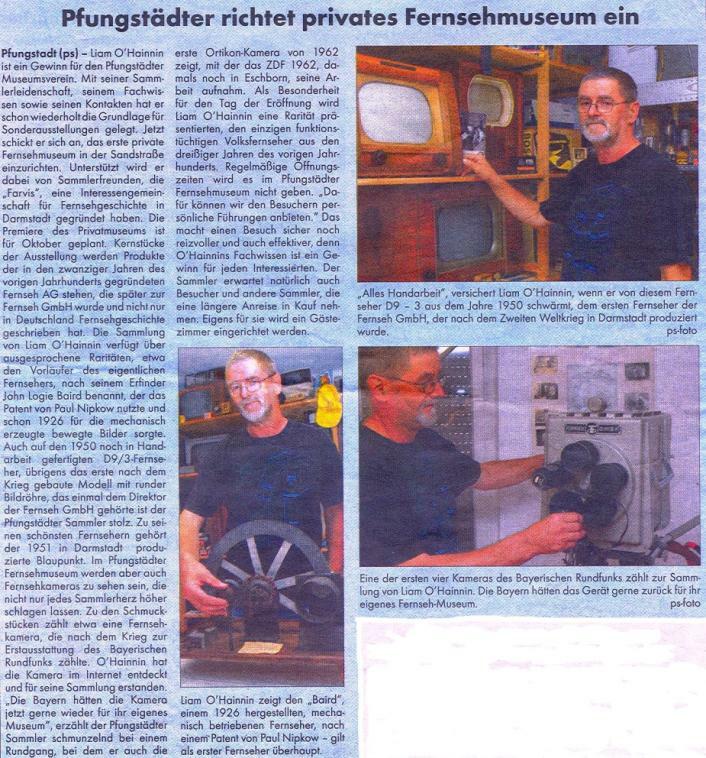 An article from the "Pfungstädter Woche"
The photos shows Liam O'Hainnin the owner of the museum and speaker for the "Fernseh GmbH Darmstadt" for the association GFGF (Gesellschaft der Freunde der Geschichte des Funkwesens e.V.). Apart from the membership in this association, he is also member of the english TV association "405 alive". Our TV museum and our webpage will be expanded and updated regularly. We are thankful for any contributions, recommendations and exhibits to expand our TV museum and the webpage. There are a lot of reports about the innovator of the Tv. Here you can see a report about one of the first viewers. A woman from Ireland, the secretary from John Logie Bird.